Yes you may install a satellite dish and/or cable TV per the provisions of the Telecommunications Act of 1996. Simply stated, homeowners are allowed to install a "dish" antenna that is one meter (39") or less in diameter and is designed to receive direct broadcast satellite service, including direct-to-home satellite service. Any satellite dishes and antennas over one meter (39") are not covered by the Act and are therefore still prohibited in Piney Creek. The Act and Rules permit some regulation by the Association, such as the means, method and location of the dish or antenna installation, as long as no "unreasonable" delay or cost is involved. The Association can still require compliance with building codes, unobtrusive placement, painting, camouflage and other reasonable measures to ensure the safety of the installation and minimize the visual effect on the community. Homeowner's are required to submit an Architectural Improvement Request Form for approval of the placement of the dish. Residents are requested to be sensitive to their neighbors and work with the installers to choose an aesthetically pleasing location so that property values are not adversely affected. Homeowners are asked to hide coaxial cable behind brick, wood trim, gutters, downspouts, landscaping, etc. so that the least amount of cable is visible to neighbors and drive-by traffic. How long does it take the Architectural Control Committee (ACC) to review my request? The governing documents for Piney Creek allow the ACC 45 days to review your request, however, most requests are handled in 7 - 10 business days. The ACC does not wait for its monthly meeting to review requests. Requests are generally mailed to ACC members on the same business day that they are received in the clubhouse office. Incomplete requests and requests that lack sufficient supporting documentation are returned to the homeowner, delaying the review process. Please read the instructions thoroughly. Homeowners who proceed with their improvement without the approval of the ACC do so at their own risk. When do I have to file an Architectural Improvement Request Form with the Architectural Control Committee (ACC)? Any exterior alteration or addition to your house and/or landscape requires the submission of an Architectural Improvement Request Form to the Architectural Control Committee for Piney Creek (ACC). This includes the front, back and side yards. Repainting or restaining your house requires the submission of a request form and color chips (color samples) to the ACC. Forms may be obtained by calling the community manager at 303-699-8069 or you may print out the on-line version of the form by clicking here. You may access specific guidelines concerning ACC issues by clicking here. Who should I call with my Architectural Control Committee (ACC) questions? The on-site community manager is the proper person to call when you have an ACC question. Please do not attempt to contact our volunteer ACC members. Requests and questions must be routed through the on-site community manager at 303-699-8069. How do I make a clubhouse reservation? Clubhouse reservations are arranged through the on-site community manager at 303-699-8069. The Piney Creek clubhouse is available for use by members of the Piney Creek Recreational Association, Inc. Reservations are on a first come basis and may be made no sooner than 45 days in advance of your event and no later than 5 days prior to your desired date. Piney Creek residents reserving the clubhouse must be present during the function for which they have made a reservation. A security deposit of $600.00 is required. There are currently no additional charges for using the clubhouse. You may also obtain further information about the clubhouse by clicking here. Can I have my maintenance fees automatically deducted (EFT) from my checking or savings account? Yes you can. You may arrange this by requesting a form from the management company at 303-369-1800. A copy of this form is also published in each edition of the Piney Creek "Chronicle" newsletter. The form can also be found on Westwind Management's web site by clicking here. We encourage you to sign up for this no cost direct withdrawal by Electronic Funds Transfer (EFT). How do I get my maintenance fee payment coupon book? After your title company notifies the management company of a change in ownership, a maintenance fee payment coupon book is ordered for you. It will be sent to you in the mail. How quickly you receive your coupon book is dependent upon how quickly the title company notifies the management company of your closing. If you have not received a maintenance fee coupon payment book within 60 days of your closing, please contact the management company at 303-369-1800. Maintenance and Recreational association fees are due on the first (1st) of each month. If payment is not received by the 30th of the month, a late fee of $10.00 per Association will be assessed to your account. What is the approved fence stain color? COLOR - "Piney Creek 1"
COLOR - "Piney Creek 2"
The staining of visible fence surfaces is mandatory in The Meadows, Filing #8, and in the Glen Filing #13 per the protective covenants. Homeowners residing in the other sub-divisions are encouraged to stain their fences using the approved products. The Architectural Control Committee (ACC) does review the condition of private fences on an annual basis. Requests are made to homeowners to repair and stain their fences when these fences become unsightly. All fences must meet the standards for appearance in the neighborhood. If staining is necessary to meet the standards of appearance, the ACC may require it. The Board of Directors for the Piney Creek Maintenance and Recreational Associations has agreed to provide a small quantity of the approved Piney Creek fence stain to homeowners who need to stain over graffiti or replace/repair a small number of fence pickets on privately owned fences. They have also agreed to provide a limited number of fence pickets for repairs. The stain is available in one-quart containers and the limit is on-quart per homeowner. Pickets are limited to four (4) per homeowner. These supplies are free. You may arrange to pick up these supplies by contacting the community manager at 303-699-8069. In general, fences that border common areas of the community are maintained by either the Piney Creek Maintenance Association, Inc. or the Piney Creek Recreational Association, Inc. This maintenance includes the repair and/or replacement of lumber and the staining of the common area side of the fence. In some cases, repairs and/or replacement of lumber can be limited by landscape conditions in the homeowner's yard. Homeowners are expected to create adequate access for repairs and/or maintenance. Fences which border the school properties (or any other property which is not owned or maintained by the Associations) are the responsibility of the lot owner to maintain. Neither the Piney Creek Maintenance Association, Inc. nor the Piney Creek Recreational Association, Inc. are aware of specific details regarding shared fencing between neighbors. Neighbors are encouraged to negotiate their responsibility for private lot line fencing amongst themselves. If Associations are Non Profit, why are we subject to any tax? During our most recent annual meeting, the subject of tax liability and tax status for the Associations was raised. Since the Association’s CPA was not in attendance, we sought his input and have published some comments here for your consideration. One of the most common misconceptions of HOAs is that non-profit means no taxes. Piney Creek Recreational Association is a 501(c)(7) corporation which classifies it as a tax exempt social/recreational organization. These organizations are exempt from paying tax on income related to the purpose for which the organization exists ("exempt function income") but are taxed on any unrelated business taxable income ("UBTI"). The reason PCR exists is to provide and maintain recreational amenities for its members. Membership fees and related collection fees are examples of exempt function income. Earning interest at the bank, receiving money from a utility company in exchange for an easement or receiving a gain on the sale of a foreclosed home are examples of UBTI and are taxable. Piney Creek Maintenance falls under Internal Revenue Code 528. Section 528 specifies a series of provisions which, if met, allows them the option to file either Federal form 1120 or 1120-H. Form 1120 is a standard corporate income tax return (e.g. General Motors files this form). Any net income (or operating surplus) is taxed at 15% up to $50,000 but HOAs rarely have income larger than that. Form 1120-H is specifically for HOAs and does not tax the HOA on any income related to the purpose for which the Association exists. Income is taxed at a flat 30% on the 1120-H. The reason why the majority of HOA returns are filed using form 1120-H despite the higher tax rate is that form 1120-H is far less complex to prepare (and less expensive to have prepared) and the majority of HOAs do not have taxable income thereby making the difference in tax rates a non-issue. Who do I contact regarding a neighborhood pet problem? Piney Creek continually receives complaints about pets running loose or pets making excessive noise. If a pet is causing a persistent problem, you may contact the City of Centennial Animal Services at 303-325-8070 or after hours at 303-795-4711. Public streets in Piney Creek are maintained by the City of Centennial Public Works Department. This includes street maintenance, sidewalk repair/replacement and snow removal. The 24-hour call center can be reached at 303-325-8000.
Who should I call when a streetlight is out? Please provide the exact location of the street light problem. Cross streets or street addresses are most helpful. In the event you are having problems getting a street light repaired, contact the community manager at 303-699-8069. Why do solicitors show up at my door when Piney Creek is clearly marked "NO SOLICITING"? Piney Creek is constantly targeted by door-to-door solicitors. Although Piney Creek is posted with "NO SOLICITING" signs, the Sheriff has informed us that there is no ordinance within Arapahoe County that allows the Sheriff to enforce our "NO SOLICITING" signs. There are laws about criminal trespass and harassment that allow private homeowners to file complaints against individuals and the companies they represent. If you are having a problem with a solicitor or door-to-door sales person, please call the Arapahoe County Sheriff's Office at 303-795-4710. The best advice from the Sheriff's Office is to avoid the solicitor by refusing to open your door to a person you do not know or recognize. 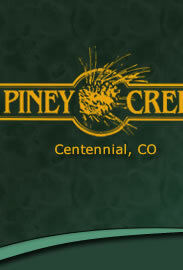 Who is the management company for the Piney Creek Maintenance Association and the Piney Creek Recreational Association? Westwind Management Group, Inc. performs all financial and business management services for both associations. They prepare the monthly financial statements, collect maintenance fees, distribute the maintenance fee coupon books, prepare account status letters for title companies and can assist you with setting up an Authorization Agreement For Direct Deposits (EFT Credits) for the automatic payment of your maintenance fees. Questions and assistance regarding Architectural Control Committee issues, clubhouse reservations, use of the recreational facilities, etc. should be addressed with the on-site Community Manager at 303-699-8069.
Who is the management company for the Overlook sub-division? Can I advertise in the Piney Creek "Chronicle"? The "Chronicle" accepts paid advertising and classified ads. Piney Creek residents may place reasonably sized classified ads (non business) free of charge. Please contact the management office at 303-369-1800 x 121 to obtain information on ad sizes, rates and submission requirements. You can also click here. How often is the Piney Creek "Chronicle" newsletter published? The newsletter is published quarterly in mid-February, mid-May, mid-August and mid-November. Submission deadlines for articles, letters to the editor, paid advertising and classified advertising are January 17th, April 17th, July 17th and October 17th. You may obtain further information about the newsletter by clicking here. Please call the management office at 303-369-1800 x112 with your other questions about the Piney Creek Chronicle newsletter. Can I reserve the greenbelt or park areas? The use of the greenbelt and park areas is on a first come, first serve basis. No reservations are made and no permits are issued. How do I get my Piney Creek recreation membership keycard so that I can use the pool? Recreational Association Access Control Key Cards will be available to members in good standing of the Piney Creek Recreational Association, Inc. Key cards can be obtained by contacting the onsite Community Manger. Two key cards may be issued per household. Members who are delinquent in the payment of their maintenance fees in excess of 60 days may find their privileges suspended until such time as their maintenance fee account is current. Swimming lessons are available through the lifeguard staff. The lifeguard staff are employees of the pool management company hired by the Piney Creek Recreational Association, Inc. to manage the swimming pool facilities. Swimming lessons are an additional cost item and all arrangements for swimming lessons are a private contract and understanding between interested homeowners of Piney Creek and the pool management company. The swimming lesson session schedule is generally published in the second quarterly issue of the Piney Creek "Chronicle" newsletter. This issue is mailed to homeowners approximately one week prior to the pool opening. Swim lesson sign-ups begin the first day that the pool is open. Arrangements for swim lessons must be made with the lifeguard staff. Can I reserve the swimming pool? Yes, the swimming pool is available for reservation to members of the Piney Creek Recreation Association, but only after open swim hours (close to 11:00 pm). The cost to reserve the pool is $15 per lifeguard, per hour. One lifeguard is required for every 20 people attending the event, whether or not they intend to swim. Pool reservations are not permitted during open swim hours. If you are interested in reserving the pool, please contact the Onsite Community Manager at 303.699.8069 or via email at mgr@pineycreek.org. Additional information regarding pool reservations can be found in the Swimming Pool Rules or by clicking here. How does the "Heat" swim team work? The Piney Creek "Heat" is a great swim program open to all Piney Creek kids as young as 5 and as old as 18. Swimmers must meet a few requirements to be on the team and all children of Piney Creek are encouraged to participate. The Piney Creek "Heat" swim team is organized, supervised and run by a parent Board of Directors. The team is not run by the Piney Creek Recreational Association. Information regarding the swim team is generally published in the 1st and 2nd quarter Piney Creek "Chronicle" newsletter. You may obtain current contact information for the swim team by calling the on-site community manager at 303-699-8069. You may also obtain further on-line information regarding the Piney Creek "Heat" swim team by clicking here . What are the hours for open swim? New open swim hours are in effect for 2013. The pool will open one hour earlier on weekends, and close one hour later on Friday and Saturday. Monday - Thursday 11:00 a.m. until 8:00 p.m.
Friday 11:00 a.m. until 9:00 p.m.
Saturday 9:00 a.m. until 9:00 p.m.
Sunday 9:00 a.m. until 8:00 p.m.
During the Piney Creek "Heat" swim season (from approximately the beginning of the pool season until the third week in July), open swim hours are adjusted for swim meets hosted at the Piney Creek pool. These hours and dates will be posted in the pool area. When does the swimming pool open and close? The pool opens on the Saturday of Memorial Day weekend and closes at the end of the day on the Monday of Labor Day weekend. Access to the tennis courts requires a key card. Members of the Piney Creek Recreational Association, Inc. may obtain a key card from the on-site community manager, 303-699-8069. Starting each April and lasting until fall (timing is weather dependent) tennis court reservation sheets are posted on the front brick of the clubhouse. Typically, each Wednesday afternoon, reservation sheets are posted for the following week for all eight courts. You must sign up for court reservations in person. Recreational Association amenities are private property and are for the exclusive use of the members in good standing of the Piney Creek Recreational Association, Inc. Court reservation sheets are maintained by our tennis management company Rocky Mountain Tennis Academy, 303-791-6720. Rocky Mountain Tennis Academy notates the reservation sheets in advance for Pro Court use, tournaments, league play, etc. What are the hours for tennis court use? Tennis court hours are typically from dawn to dusk. The six (6) lit courts, two (2) on the east side and all four (4) on the west side, are available for use until 10:00 p.m. each evening. The lights are on timers. The timer for courts 3 and 4 on the east side of S. Joplin Way is located inside the gate of court 3. The lights for courts 5, 6, 7 & 8 on the west side are activated by the same key that opens the court gates. The key switch is located at each gate. How does trash removal work at Piney Creek? Piney Creek has a master contract with Waste Management (303-797-1600) for trash removal. The cost of trash removal is included in your monthly maintenance fee paid to the Piney Creek Maintenance Association. Trash pickup day is every Monday with recycling days being every other Monday. 96 gallon toters for trash and recycling are available at no cost. To request toters please contact the Community Manager. The Association will be notifying Waste Management on a weekly basis of requests, Waste Management will then deliver your toters to your residence within the following two weeks. We ask that you put your requests through the onsite office in order for the Association to be able to track how many homeowners are participating. Waste Management does have guidelines concerning excess trash, weight of containers and large item pickup. You are encouraged to contact Waste Management to obtain these guidelines. Be Courteous With Your Trash! 1. Trash bags and trash containers must be stored in areas that are not visible from the street and are not visible to neighbors at all times. 2. Trash bags and/or trash containers may be placed out for collection as early as the night before trash pickup day and empty containers should be returned to their proper storage area the day of trash collection. Trash should be placed at the curb by 7:00 a.m. on Mondays. 4. If you are uncertain as to whether Waste Management will pickup your unusual trash (landscape debris, furniture, move in or move out trash, appliances, hazardous materials, etc.) call Waste Management (303-797-1600).